Beard oil is a must have for anyone having a beard longer than an inch or more in length. We reccomend beard oil for anyone wanting to sport even stubble. It softens the skin, the stimulates the follicles and the soothes the soul. Beard oils are a necessity. Not all beard oils are created equal. I’ve thrown a few in the trash after only a use or two. There are many companies out there with many products. Most are pretty good. Some aren’t. Put it this way if they have snazzy eye catching videos but are selling something for only a dollar, you are getting what you pay for. Having said that, there are other companies that way overcharge for products that are just average. I’ve found many a great beard oil for around $12-$15 for two once bottles. These are reasonably priced as a two ounce bottle will last a month or two depending on your length. I am, however, always watching for a good deal. 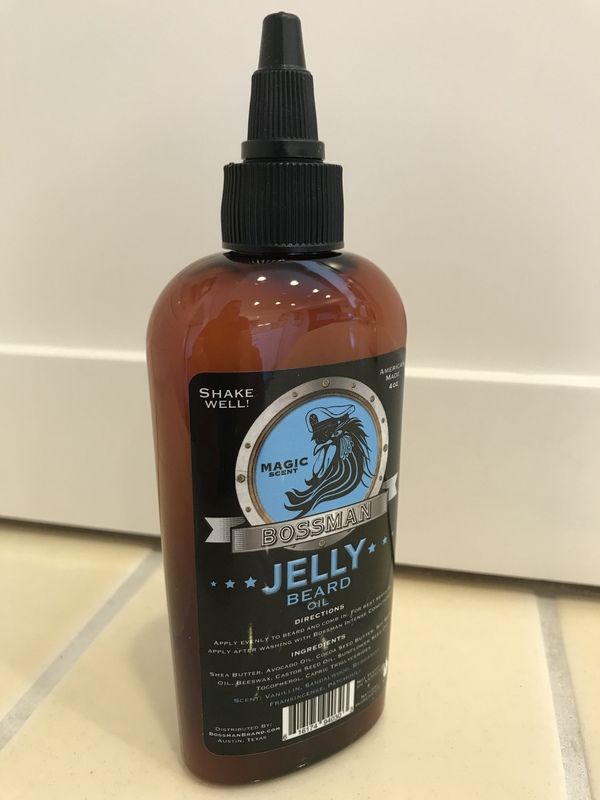 A couple of months ago I found Bossman Beard Oil Jelly on Amazon priced at $14.99 for a four ounce bottle. Four ounces? That’s a good price so I clicked “add to cart”. Skeptical I was at first try as it was thick, different and was very affordably priced, I found myself quite impressed. I’ve used it daily for two months and have ordered two more bottles. It’s now all three bathrooms and in my travel kit. It is my highly reccomended go to for daily after shower beard care and grooming. Plus it smells great!